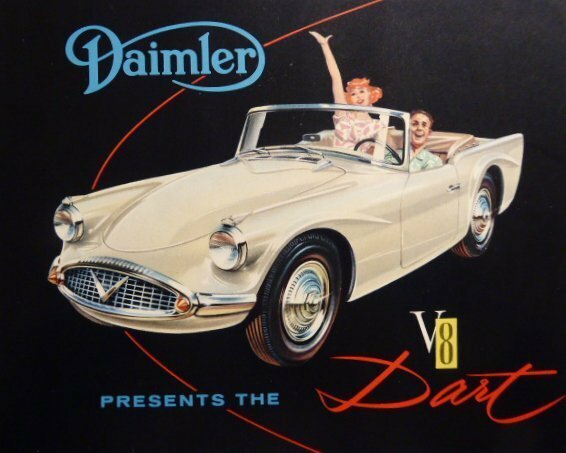 When the SP was announced, it was christened the ‘Dart’ and made its World debut at the International Automobile Exhibition in New York on 4th April 1959 – although preliminary details and pictures had appeared in the British weekly car publication ‘The Motor’ on 1st April 1959 – some April fool! Its baptism at the New York Show was overshadowed by the Chrysler Corporation objecting to Daimler’s use of the name ‘Dart’, as Chrysler had previously registered that name for one of its own in-house Dodge models, therefore, the Daimler sports car was nameless, but not shameless as time has witnessed. As soon as the New York Show closed its doors, the SP was driven on an epic Stateside coast-to-coast publicity tour – faultlessly. 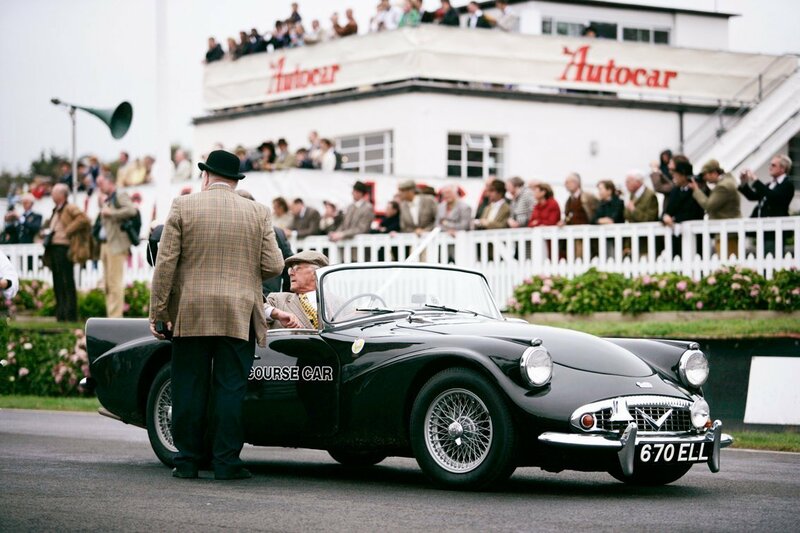 Duncan Black’s 1959 Daimler SP250 race car (#100033). Now owned by John Abel. Driver is Murray Shepherd – testing on the 23rd March 2019 at Goodwood prior to the 77th Members’ meeting. Photo courtesy of Bob White of Motor Sport magazine. It became known as the SP250 (but affectionately has always been called ‘The Dart’), which, from the outset, was its type number, a practise Daimler had used for decades. The company, to avoid internal confusion, classified the left hand drive version the SP251; however, all are usually called SP250s. 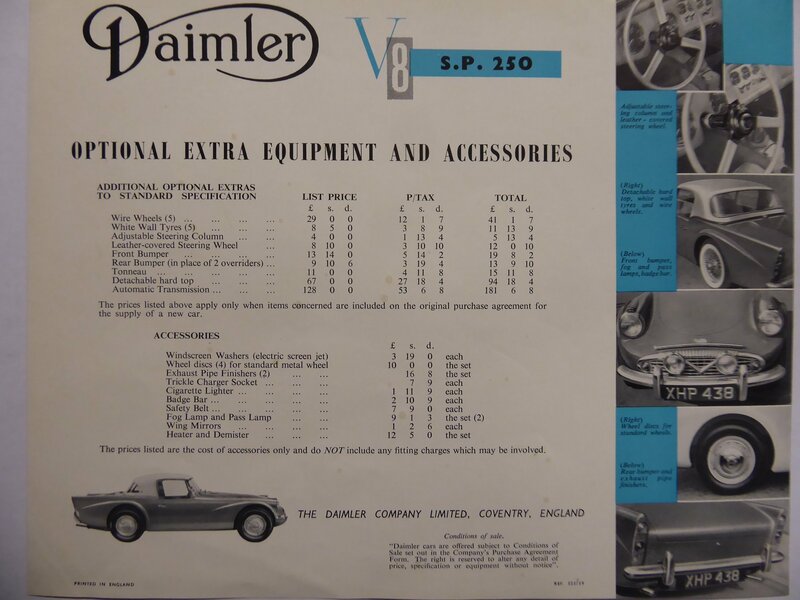 Daimler was, at that time, part of the BSA (Birmingham Small Arms) Group of companies before its acquisition by Jaguar. Amongst its many products, the Group produced the famous BSA (Beeza) motorbikes; thus within there was an abundance of exceptional engineers, amongst whom was the most distinguished motorcycle engineer, and the Group’s Automotive Managing Director, Edward Turner. It was he, ably assisted by his ‘pencil’, the much talented Jack Wilks, who had the task of designing not only the body but the two legendary V8s – the smaller of which was to power the SP (the larger 4.5 litre engine was installed in the Daimler Majestic and called the Majestic Major – an awesome saloon and legend in its own right). The North American market, including Canada, took approximately 40% of the cars produced, whilst the bulk of the balance of the production was destined for the United Kingdom, Australia and New Zealand. In those countries, the police found them useful in pursuing ‘wayward’ motorists, as it was acknowledged that the SP had a respectable turn of speed. A significant number were also exported to continental Europe. The SP had a wide and enthusiastic following in that, it was also possible to come across the car in such other diverse countries, and climates as: Aden, Bahrain, Curacao in the Dutch West Indies, Cyprus, Denmark, Jamaica, Greece, Guatemala, Gibraltar, Hong Kong, Rhodesia, South Africa, Sweden and Singapore – truly an international sports car. It is interesting to note that in the mid 1990s an SP was dragged from the jungles of Malaysia and taken to Australia for restoration. 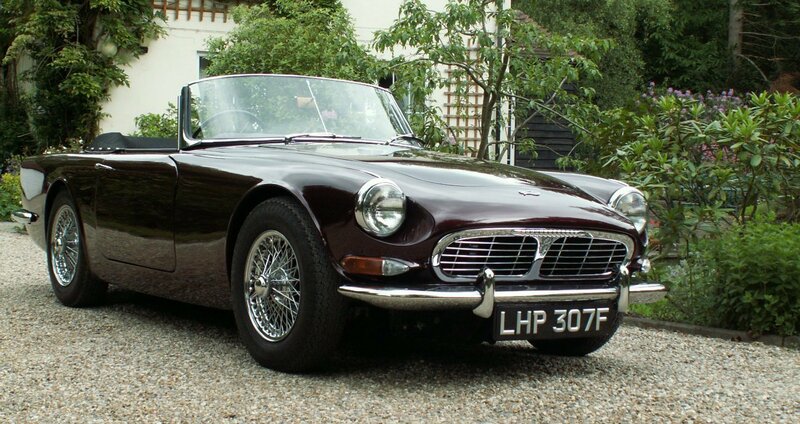 It is acknowledged that the SP was only a partial success in terms of marketing, as only about 2650 were built between the years 1959 and 1964, before being killed off by Jaguar. (competition for its own E-type?). It was however the jewel of its hemi head engine, which shone like the Koh-i-noor diamond that caused everyone to take notice. It was the smaller of the two hemi-spherical engines, rated at a conservative 140bhp and at two and a half litres capacity, that took the ‘Dart’ from a walking pace to a whisker under 130mph in top gear (close to 210kph) with its turbine like power and effortless torque. 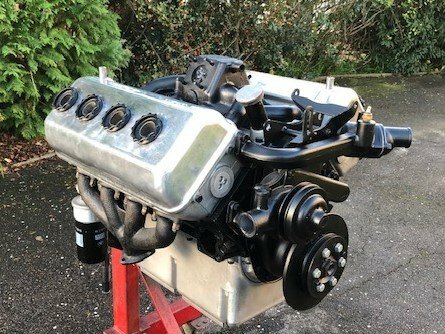 This engine was later adapted and installed to power a badge-engineered Jaguar MKII that became known as the Daimler V8 250 and that in itself was the most successful and profitable Daimler produced up to that time. The well-balanced and designed engine burns fuel – low octane at that – at about 30mpg (imperial). The engine is mounted in a conventional box section chassis, (allegedly a copy of the then Triumph TR2) has a cruciform central bracing, independent front suspension by coil springs and telescopic shock absorbers; whilst the rear is served in the time honoured fashion by semi elliptical ‘cart’ springs aided by dampers (lever arm shock absorbers). The cam and peg steering is somewhat heavy at lower (parking) speeds but its braking is awesome with disc brakes all round (not many cars of that time had discs at all) and in the cockpit the system is finished off with a sporty fly-off handbrake. The chassis is dressed overall in glass fibre – a sloping front, with a low set grille, topped off in the traditional Daimler fluted manner, whilst at the rear modest wings are employed that create a straight through flowing line – some say you either like it or loathe it. You can be the judge of that! Why fibreglass you may ask. Quite simply a matter of cost. Pressed Steel Limited wanted £100,000 for the dies to produce a metal body, whereas the moulds for the fibreglass cost only £10,000. Furthermore, Daimler already had experience of utilising fibreglass in their bus manufacturing operation. The rather low front end caused the radiator to be turned through 90 degrees and set sideways, crossflow fashion, whilst the fan is driven low down directly from the nose of the crankshaft to achieve a smooth and low drag effect. 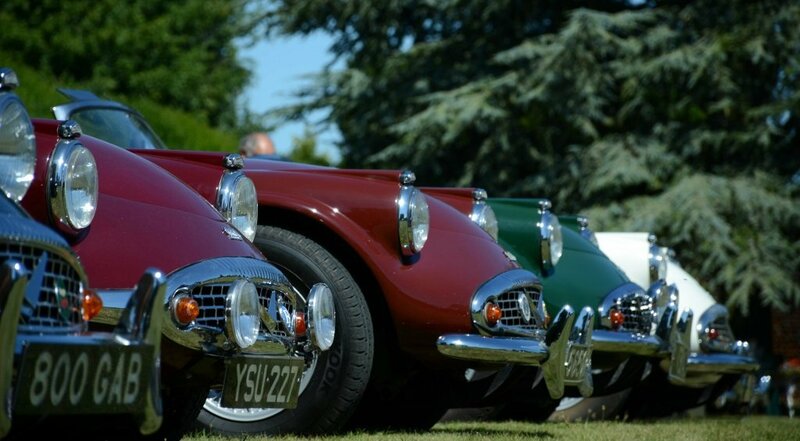 Beautiful noses all in a row. The luxurious leather interior offers ‘2+2’ accommodation – two conventional bucket seats with a full width rear ‘child’ seat. 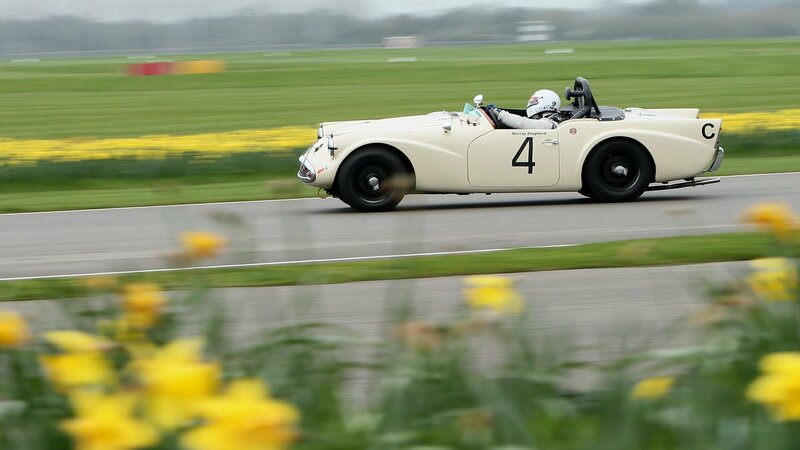 There was one three seater SP built with the rear seat set sideways – somewhat similar to the 1950s Daimler Barker special sports. The soft top is easy to raise and stow but the hard top requires the effort of two. The other notable revelation is the very sizeable boot, which can accommodate a generous amount of luggage – more so than most of its competitors. The large doors are a great asset to climbing aboard, something again that its competitors lacked. 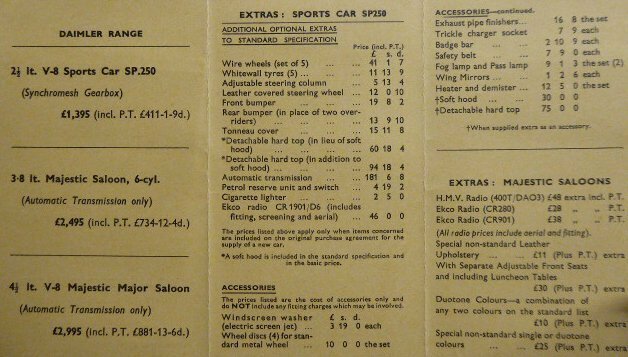 An early (1959) accessories price list. The car is well equipped, the leather padded instrument panel, has an efficient layout, in that it consists of a speedo, with a matching rev counter – red lined at 6,000rpm. Both are strategically (or deliberately!) placed in front of the driver, whilst gauges for fuel, oil pressure, ammeter and water temperature sit atop a row of switches for lights, wipers, choke and the ignition. Another notable attribute, that its competitors lacked, is the provision of wind up windows. 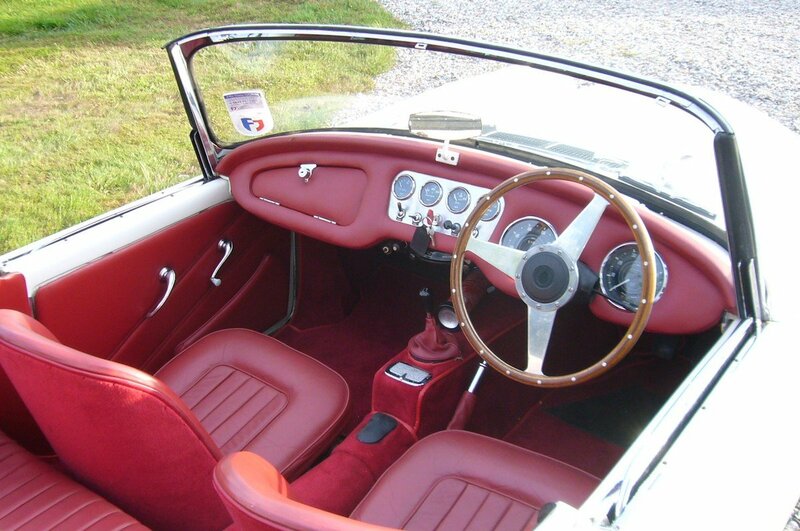 Amongst other features and accessories are: trickle charger socket (with plug), cigarette lighter, heater/demister, petrol reserve unit, adjustable steering column, tonneau cover, radio, fog & pass lamps, with the choice of hard or soft top or both; bumpers to front and rear, to which over riders could also be specified. Several of these items did in the passage of time become standard fittings as the model progressed. Many of the cars were fitted with the optional painted wire wheels and, in a number of cases these were chrome plated. A manual gearbox was the initial choice for the transmission, with the added benefit of an overdrive as an option – only a couple of cars were so fitted, many have in fact now been retro-fitted with this desirable extra, or a more modern 5 speed gearbox conversion – to create a more relaxed touring vehicle. The car could also have been specified with a Borg-Warner automatic gearbox – it’s more robust than the manual box. An automatic sports car! Bear in mind that the target market was the States where they devoured European sports car at an alarming rate in the late 1950s and, by offering an automatic option, the company hoped to gain additional profitable sales to the more mature sports car motorist – nowadays referred to as the ‘grey’ market. In all reality it was still possible to have a car to your own colour scheme and specifications – Daimler still offering the bespoke car! 1960 Price List which also shows colours as: Royal Red, Racing Green or Ivory. All with Tan leather only. After the Jaguar take over; the SP gained much from the extended team of race proven engineers with their in-depth knowledge of design and chassis development of sports/racing cars. The SP in received a makeover almost immediately with improvements to strengthen the chassis and cure the body shake, which on earlier SPs had been a source of some criticism. These improved cars, appearing in the Autumn of 1960, became the ‘B’ spec. They received side beams extending alongside the main chassis rails from the inner rear wheel arch to almost the front wheel arch, passing under the door post pillars and in addition a rear upright (B post). Bracing within the cockpit in the form of an inverted ‘U’ was also added, these modifications all designed to give the required rigidity – albeit with the penalty of an increase in weight. Later still, in early 1963, the ‘C’ spec arrived which was a “B” spec with many of the aforementioned options and accessories fitted as standard equipment. Thereafter the original model became known as the ‘A’ spec. It is this ‘A’ spec model that the racing fraternity prefer as it is much lighter. In fact, the late Ian Geoghegan, one of two Australian brothers, was timed in the earlier 1960s at the Mt Panorama Circuit on the Con Rod straight at 128.6 MPH; and with his brother Leo a successful win in the Bathurst six hour race completing five laps more than their nearest competitor. There was under consideration a further development of the SP, known as the MKII or SP252 – this, however, was aborted by Jaguar; nonetheless one of two prototypes has survived to this day. 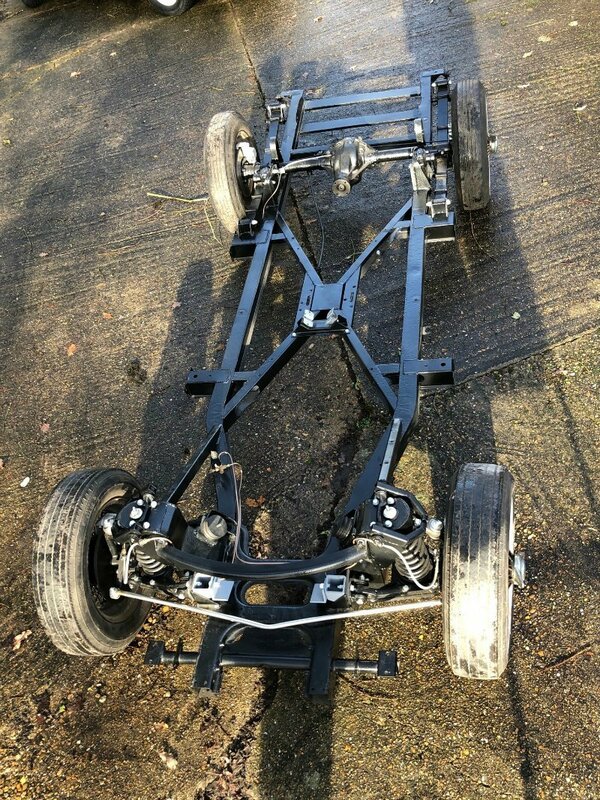 It is on (prototype) chassis no: 100005 and looks somewhat sleeker than an SP with a side profile comparable to that of an MGB and a dashboard layout similar to that of an E-type Jaguar.